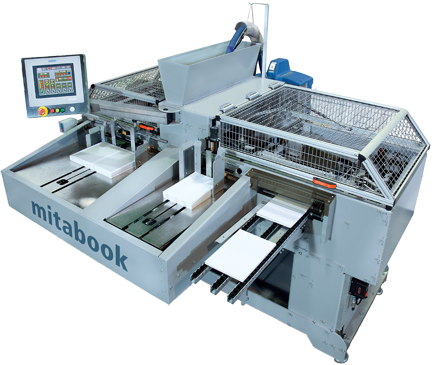 A fully-automatic, hardcover, casing-in machine, specially designed to economically produce hardcover photo books and children’s books in small quantities, for example photo books, children books etc. PUR perfect bound book blocks can be cased in right after binding. Practically zero make ready small floor space and easy of operation make the Mitabook a unique production line. The book block does not have to be split in the center prior to be placed onto a wing.